There is a good reason why each of the premium titles that were created by the Cube Escape (Free) developer bear the name Rusty Lake. Seeing this name should evoke the same sort of gut reaction upon seeing the words Twin Peaks. For those of you who are familiar with either of those names, you know you are in for a surreal cult series that is designed to bend the edges of reality. 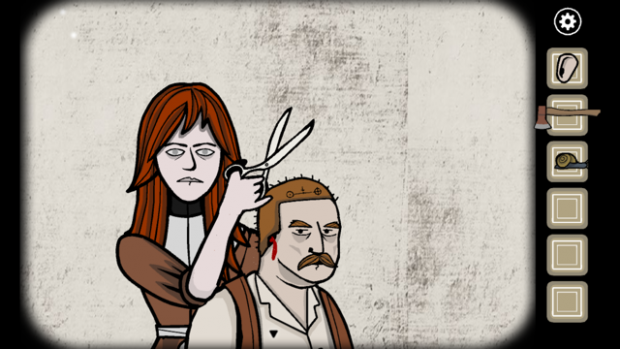 The tv show is a classic and broke new ground, and while Rusty Lake Paradise ($0.99) is only a sequel it does offer a lot of new story and of course new puzzles to solve as well. In Rusty Lake Paradise, you are prodigal son Jakob Eilander returning to Paradise Island attempting to rid your family of a series of plagues that are all quite biblical in nature. You will solve puzzles, many simple, some quite difficult in order to accomplish your goals and save your family from a terrible fate. As you venture from one plague to another, you will retread your paths on the island but also open up new and disturbing avenues to explore. The term gamebook has risen in use in recent years to describe a genre of games whose mechanics are either light or are mainly existant to push a narrative forward. 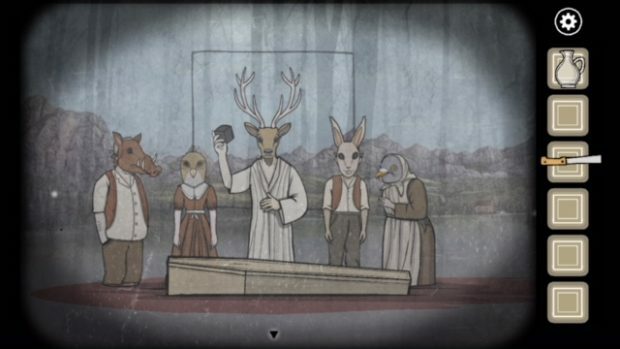 Whereas some puzzle games, like the Professor Layton Games($15.99) or The Room ($0.99), push the gameplay to the forefront, Rusty Lake Paradise puzzles exist as a means to an end of story telling. I would contend that in many ways this makes this game a sort of Puzzlebook where you are guided through a story line via the means of relatively muted gameplay characteristics. There do not seem to be any side-quest or side-path puzzles that you can pursue as an alternative, the main story is always the focal point of the game. The story and setting and feeling of the game is very much the centerpeice and heart of Paradise. The music actually reminds me in many ways of the dreary drone of Banner Saga ($9.99) which is a massive compliment. One thing that always impressed me with Banner Saga was how much a theme of sadness and defeat can really imprint on someone when the proper tools are used in the right way. Paradise does not deal so much with sadness as it does with weirdness and a certain sense of austerity that you cant find much of outside of an Edgar Allen Poe peice. Much like Poe, I think Paradise can be considered in many ways a work of gothic horror even if you dont have jump scares and even though it is not billed as a horror game. I realize as I am writing that I really have not gotten into the story or really even the gameplay of Paradise and I don’t think I will very much. There are some spoiler-y things that would better be left to the player to uncover for themselves and as I before mentioned, the gameplay of the puzzles is muted. Some are more difficult than others but they don’t seem to be the primary focus of the game. It would be nice to get a hint system like the Layton games have, but I can understand that it might in some way clutter up the interface which is very very minimal and clean. The artwork in the game is of that same gothic fabric the music seems to be made of. It is a delight to watch and listen as the weaving of the two set the characters and the scenes into a universe that seems fundamentally absurd and yet in some ways plausible. There are some nice visual indicators that eventually make sense only after coming back to a location the 2nd or 3rd time and some that while unresolved seem completely baffling. Even though the same locations are used and reiterated on in each plague, the scenery evolves and subtle changes are made that tell a visual story of the impact each plague has on the island. One thing I will mention regarding gameplay is that the inventory system and item management is the same as previous games and it works very well. Tap an item in the inventory to highlight it and use it on the next thing you tap outside the inventory. Not exactly groundbreaking, but its a good way to implement a non-intrusive item management into a stripped down puzzle interface. A negative thing I noticed is that there were a few instances where simple trial and error carried me through some of the puzzles rather than having an underlying logic that I could discern. As one would expect of a gamebook, Paradise does not consume large amounts of processing power and sits at a lean 108MB on my iPhone 6+. Battery drain did not increase after having the app running on my phone for several hours and you should really not see any type of additional battery loss by running this game that wouldn’t be consistent with a small to midrange sized game. 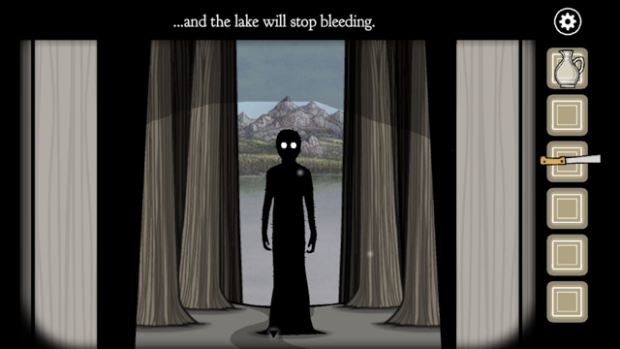 Paradise stands as a solid stardard bearer for the Rusty Lake brand. As a stand alone installment, this is as good a place as any to get into the narrative feel and personality behind these games. For veterans of this series of games you will find nods and small connections to the predecessors of Paradise. If you are looking for a dark story with some themes of rituals, biblical plagues, family secrets and a few highlights of puzzle gameplay, you are going to fit right in with what this game offers. While I wouldn’t reccommend for very young children I was able to play this game in front of my gradeschool aged kids with a few caveats and explanations of certain events. It’s a great addition to the Rusty Lake cult series of strangeness and worthy of a few bucks for the avid gamebook enthusiast!